The Street Fighter RPG is the gift that keeps on giving. We have already recounted the the sorry tale of the original White Wolf Street Fighter RPG and what amounts to the game's Monster Manual. 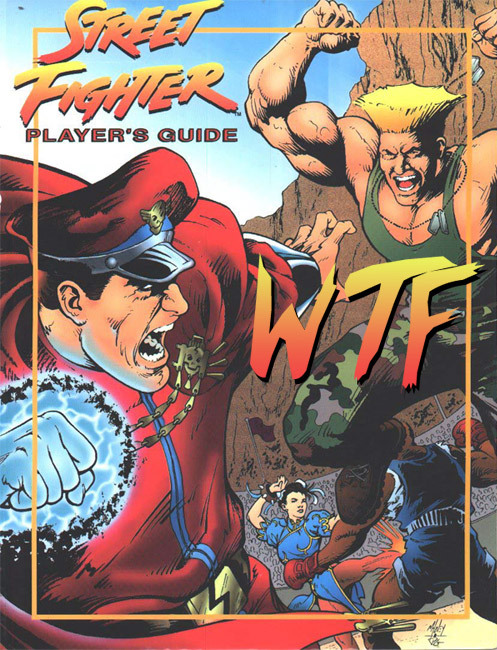 There was also a Player's Guide full of additional head-exploding martial arts for gamers to train their half-ox mutant fighter pilot ninja. Most distressingly, there was an E. Honda pantload of confusing artwork. Zack: Welcome back to the stage of history. Zack: You think you can challenge me? Steve: Now boarding a one-way flight to graveyard. Zack: I hope you have a well-spoken relative, because you're going to be needing a eulogy. Steve: My fists will write a rejection letter on your face. Zack: Better call 9-1-1 now and leave the phone on the ground for evidence in the inevitable capital murder case against me. Steve: Look at us, dude. We're role playing! Zack: It's a Street Fighter new year. Steve: I wasn't really impressed with the other two Street Fighter books we have looked at, but I've got an open mind. I'm ready to change my opinion. Dungeons & Dragons: Dungeon Module S1 "Tomb of Horrors"